European 2 pin (EN50075) to C7 with H03VVH2-F 0.75mm_; 6 feet. Europe 2 Prong . Item Number: P-ZIP-06B-G Standard: EN50075 to IEC 60320-C7 . Purchasing this item will earn you 2 reward points (Reward point(s) $0.06) ! 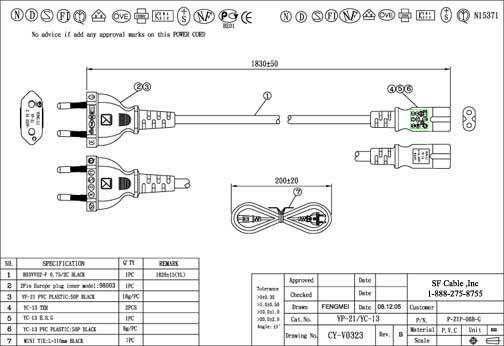 Europe to C7 power cord: CEE7/16 standard European 2 pin plug to IEC C7 with H03VVH2-F 0.75mm wire black power cord. 6 feet with all European country approvals including VDE. Testing 100% are individually tested for Hi-Pot (dielectric voltage withstand test), opens, shorts and pinout.